We know about the sweet smell of the old fashioned daphne plant, the one that flowers in winter, however with many more species available such as Daphne Cneorum or ‘Rose daphne’ and sometimes ‘Garland Flower’ we thought it best to take a closer look. Daphne Cneorum flowers in spring, (see picture right) and has masses of bright pink flowers, this is a ‘suckering’ small shrub preferring slightly acidic soil, so it would grow well in the shade of a camellia. Usually reaching under .5m flowers may continue through summer. It is evergreen, fragrant and would do well in a shaded position in the rock garden. Like most daphnes it does not like to ‘be disturbed’ so plant and leave alone, although we have seen them growing well in containers. Daphne Cneorum Variegata with its green foliage edged with cream adds a little more interest throughout the year. 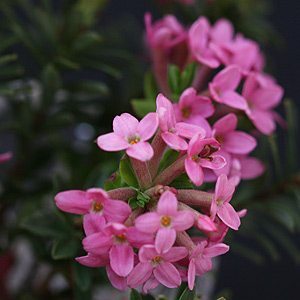 Daphne cneorum ‘Eximia’ and Daphne cneorum ‘Ruby Glow’ are cultivars not generally available in Australia. Propagation is from cuttings (softwood or hardwood) or for the patient gardener, from seed. Pruning, really not needed, if you pick a few flowers each year that will keep it in shape. Fertilize with a liquid seaweed fertilizer and remember to mulch.